What lurks in the Arctic’s thawing permafrost? From the air, the coast of Greenland appears vast and tranquil. Hundreds of fjords, their surfaces a mirror of blue sky and cloud bottoms, divide the territory. In the gaps between them, the terrain folds over itself, hill over hill, descending into obsidian lakes. The turf is covered in the waxy pastels of alpine dwarf willows and the dull white of age-bleached lichen. Though an immense ice sheet sits in its interior, Greenland’s ice-free coast encompasses almost 159,000 square miles and and houses 57,000 people. In other words, it is larger than Germany with a population half the size of Topeka, Peoria, or New Haven. It is possible to stand on a hill outside the coastal town of Ilulissat and hear only the grass quaking, the harbor ice dully grinding against itself. I visited Greenland because, lately, the land here has gone soft, and disquieting things threaten to wake in it. Let me orient you. At the top of the world, there is water. Television anchors sometimes speak of the Arctic Ocean as the “polar ice cap,” but that is a contingency of temperature and a quirk of today’s climate. Consider it instead a landlocked ocean, a northern Mediterranean Sea. Surrounding it sit great landmasses—Europe, Asia, North America—and a surfeit of islands. Among the largest are Svalbard, which is due north of Norway and so dense with polar bears that everyone who strays beyond its sole settlement must carry a rifle; Novaya Zemlya, the site of the largest atomic test ever conducted; and Greenland. In all of these places, rich, marshy soils run from the edge of the interior ice right up to the ocean cliffs. Once, this dirt gave rise to lush ferns and open grasslands; now, after 35,000 years of frigid cold, we call them permafrost. Despite their name, they are not permanently, or entirely, frozen. Every winter, a sheet of ice blossoms over the Arctic sea, and the soils seize shut with frost. Then, during the long summer days, the ice breaks up and the permafrost partially thaws. Lately, as summers have lengthened and winters have warmed, this seasonal transformation has lost its symmetry. What biologists call the permafrost’s “active layer”—the part of the dirt where microbes and other forms of life can live—now reaches farther underground, and further north, than it has for tens of thousands of years. The newly active permafrost is packed with old stuff: dead plants, dead animals, mosses buried and reburied by dust and snow. This matter, long protected from decomposition by the cold, is finally rotting, and releasing gases into the atmosphere that could quicken the rate of global warming. This matter is also full of pathogens: bacteria and viruses long immobilized by the frost. Many of these pathogens may be able to survive a gentle thaw—and if they do, researchers warn, they could reinfect humanity. Climate change, in other words, could awaken Earth’s forgotten pathogens. It is one of the most bizarre symptoms of global warming. And it has already begun to happen. The Russian botanist Dmitri Ivanovsky was just 28 when, at a scientific meeting in St. Petersburg, he presented evidence of an unexplainable phenomenon: He had found a disease with no germ. When he exposed tobacco leaves to a certain clear liquid, he could watch the leaves mottle, but he could not find the bacteria under his microscope that could explain the change. In the decades before his work—it was 1892—Louis Pasteur and other scientists had demonstrated that microscopic life could cause disease. But here was a disease with no microbe at fault. Ivanovsky said that the disease must be inherent to the gloop he had put on the leaves. He termed it a virus, from the Latin word for slime. One hundred and twenty-five years later, we still use Ivanovsky’s term, but we know viruses are far stranger than he ever imagined. An individual virion, the unit of viral existence, makes many copies of itself over its life cycle, but it never does something that can be described as living. It never breathes or mates. It punctures a cell’s wall, hijacks its protein factories, and forces it to make more of itself. A single virion can make tens of thousands of copies of itself near instantly. Viruses are living nonlife, a desirous but mindless substance. At the frontier of viral life are Jean-Michel Claverie and Chantal Abergel, two professors of microbiology at Aix-Marseilles University who happen to be married to each other. Since the turn of the century, they have established themselves as two of the world’s most famous microbe hunters. In 2002, while researching Legionnaires’ disease in their lab in Marseilles, they discovered the largest virus ever: Mimivirus, a virion so large that it could be seen under a microscope. They have identified four more monster viruses since, all several times larger than any virion known to science before 2000. Their menagerie oozes about in a far-flung set of landscapes: one monster virus was found in a shallow lake in Australia, another lurked in a bucket of seawater hauled off the Chilean coast. A third was discovered in a woman’s contact lens. All of these mammoth viruses infect amoebae, not people. They do not pose an infective risk to us. But they are strange substances. They rival bacteria in size; they can be seen under a microscope. They are quite durable. And some of them produce more proteins than most amoebae. 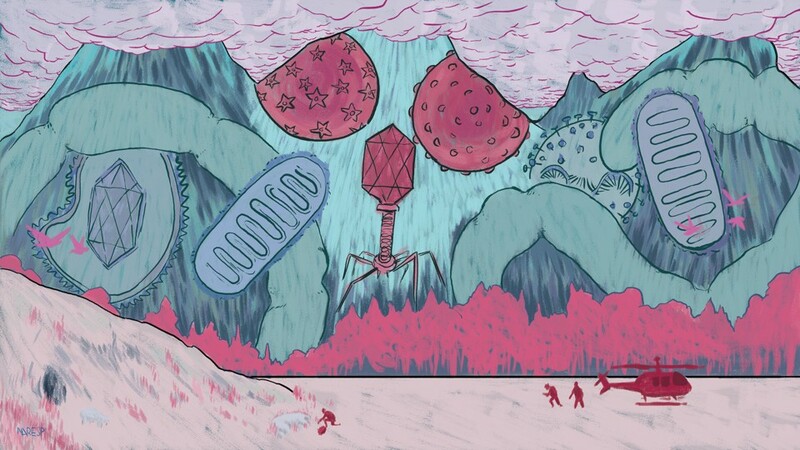 Claverie and Abergel weren’t thinking of monster viruses when they began poking around in the permafrost. 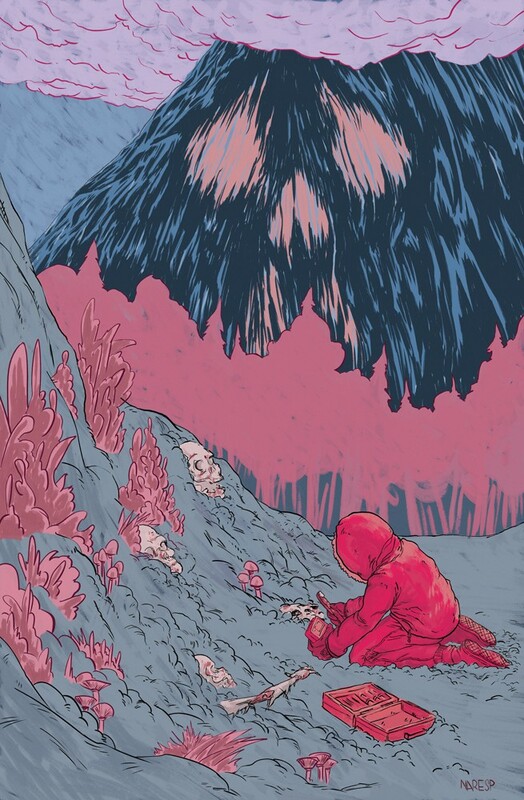 In 2013, Claverie read about a Russian team that had found a seed lodged deep in the permafrost. The fruit, buried some 125 feet below the surface, had spent thousands of years at about 20 degrees Fahrenheit, never thawing out in the wax and wane of seasons. But once warmed and placed in a pot, it sprouted waxy arms and delicate white flowers. Claverie contacted the Russian team, explained his work with microbes, and asked for a bit of permafrost to test. The team agreed, and they mailed Claverie and Abergel a sample of the same deep-frozen core of permafrost that had contained the seed. The pair pulled a small sample onto a high-resolution microscope, brought it to room temperature, introduced an amoeba as bait, and waited. And then, as they watched, a virus appeared in their viewfinder: Pithovirus sibericum, a massive ovular virion that had survived 30,000 years frozen in the ice core. It was also the largest virion ever discovered. Claverie and Abergel’s viruses aren’t a threat to humanity—yet. But human pathogens have also survived freezing and thawing in the permafrost. Last summer, an outbreak of anthrax in Siberia infected dozens of people and killed one child. The vector of disease is thought to be the thawing and decaying carcass of a reindeer killed in 1941. And a team of Canadian scientists recently found a strain of bacteria, Paenibacillus, in a cave in New Mexico that had been closed off for more than 4 million years. Though harmless to humans, the ancient bacteria was resistant to most clinical antibiotics, including most of the newest and most aggressive. The discovery suggested that bacteria can survive the most exotic and remote environments. Researchers are continuing to test the limits of pathogens. Reportedly, a Soviet microbiology lab revived bacteria from the permafrost in the 1980s, but its paper went little noticed. Claverie is traveling to Siberia this year to core even deeper into the soil, to prove that viruses can survive being thawed out after a million years. “We’re trying to go deeper and deeper in our sampling, to demonstrate that it is possible that viruses could survive—amoeba viruses. We are not going to try to revive human viruses, of course, we are not crazy,” he said. He already frets about what climate change will unlock in the permafrost, especially when humans help it along. Take Greenland, for instance. Right now, the island is a territory of Denmark, the country that colonized it three centuries ago. Greenland is slowly severing itself from Europe—in 2009, its government took over every government function from Denmark except defense and foreign policy. Denmark still pays out a block grant to Greenland every year equal to roughly two-thirds of its government budget, but independence will likely mean giving that up. To fill that eventual budget hole, Greenland has explored opening six new mines across the country. Greenland abounds in minerals—the island’s south contains the largest reserve of untapped rare-earth elements on the planet—but the Arctic’s dangerous seas and extreme temperatures have ensured they’ve never been mined. Climate change will solve both those problems, so to speak. In a paper this year in the European Journal of Internal Medicine, Claverie worried about the pathogenic consequences of opening the Arctic Ocean, specifically around Siberia and the Russian Arctic, to commercial traffic. “We know, and the Russians know, there are a lot of resources there. Very precious metals, rare-earths, petrol, there is gas and gold,” he told me. Greenland is not separate from these pressures. Getting at the minerals and petroleum deposits throughout the Arctic, he says, will require moving a lot of permafrost—an amount properly measured in millions of tons. “At once, you are going to excavate 16 million tons of permafrost that has not been moved or perturbed in a million years of time,” he said. He imagines towering heaps of rotting permafrost stacked up next to mining cabins, their contents open to the sun and air and summer rain. “We are really reaching places where, if there are microbes infectious to humans or human ancestors, we are going to get them,” he says. If one of these contagions does get loose in Greenland, Luit Penninga will be one of the first men to deal with it. He is the lead surgeon at Ilulissat Hospital in Greenland. His office looks out across Disko Bay, a gray sea 200 miles north of the Arctic Circle disturbed by azure-edged icebergs and the occasional breaching tail of a humpback whale. His entire life is dictated by the scarcity of Arctic medicine. The night before I met Penninga, he boarded a red helicopter and rode it across the bay to meet a woman suffering a pregnancy out of the womb. She lives in the village of Uummannaq, population 1,200, which has no doctors of its own. He helped her board the helicopter, attended to her through the flight, and—when the helicopter landed at Ilulissat Hospital—operated on her. It was successful. Early the next morning he invited me to visit the hospital. When I meet him, he is gentle and calm. 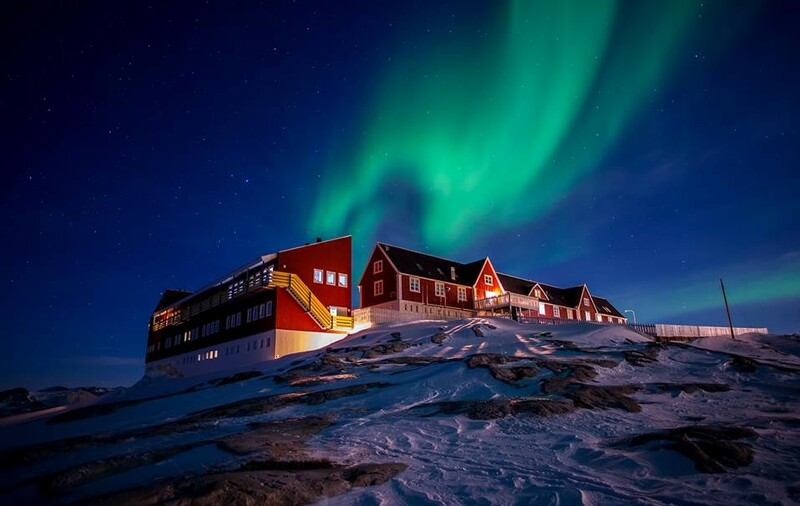 Health care in Greenland is socialized—all hospitals are state-owned and all medical care and prescription drugs are free—and the vast country is split into regions. Since Penninga leads health care in Ilulissat, he oversees human health across the entire northwest half of the world’s largest island—from Ilulissat, the country’s third-largest city, to Qaanaaq, a small town of 650 that overlooks the Arctic Ocean. Seventeen thousand people live in the region, mostly in small villages accessible only from boat or helicopter, spread out over an area larger than France. Penninga must sometimes take the three-hour flight between Qaanaaq and Ilulissat, a distance of more than 700 miles (1173 km). It costs $1400. From Qaanaaq, it’s another hour-long helicopter ride to reach some of the smallest villages, where people hunt seal and walrus as their ancestors have for generations. These transportation costs add up: In any year, between 10 and 15 percent of Greenland’s national health budget is spent on transportation costs alone. Penninga treats snowmobile and dogsled accidents, appendicitis and chlamydia and pneumonia. Many of the worst ailments are bacterial: A particularly aggressive form of ear infection, which seems endemic to Greenland, can leave holes in kids’ eardrums that last for years, permanently inhibiting their performance in school. The island also seems to have its own form of sepsis, which doctors learn to fear after a couple years of working there. “Some people can have a very short course of disease—they develop sepsis, very shortly come in, and die,” he said. When I asked him about the zombie pathogens, he laughed and nodded. “They say that, yes,” he told me. Penninga has enough problems. Some of the microbes lurking in the permafrost may be familiar: adversaries that humanity already knows and believes it has defeated. The World Health Organization brags that it has eradicated smallpox, for instance—other than the stores in the United States and Russia—but Claverie warns that it could well have survived in the tundra. Even more worrisome are the microbes we don’t know. “No one really understands why Neanderthals went extinct,” Claverie said. Sometimes, he catches himself when talking about these possible permafrost-locked diseases—they may have threatened humans or human relatives in the past, he’ll say. Then, he’ll change tense, emphasizing that they could do so again. Two weeks after I left Greenland, a patch of permafrost not far from Penninga’s office burst into flame. The press marveled around the world: a wildfire on the tundra. It raged for weeks as authorities tried to figure out how to keep it from causing anyone harm. The problem itself, the logistics involved in addressing it, required a response no one had anticipated or practiced for. Eventually, rain put it out. Such emergencies—those that overwhelm our understanding of “known knowns”—are among the most unsettling portents of climate change. Whether the emergencies of the coming century arrive in the form of fires, or floods, or plagues that rise invisibly from the ground, they’re likely to become more and more extreme and less and less familiar—a fantastical parade of crises we will be shocked to find ourselves battling. Even in its quietest places, the world will become newly hostile. Robinson Meyer is an associate editor at The Atlantic, where he covers technology.